"My mother was a country cook, plain and simple. But as I have traveled and worked and experienced foods from around the world, I look back and realize that many of the dishes she prepared, while simple, were perfect for that moment. Sometimes we have to put emotion and love in a dish to make it extra-special. The dish I am going to give you today is one like that. Simple and easy, yet full of love and goodness. My mother used to serve this with corn on the cob and cornbread. Very inexpensive and very good as well. Enjoy an Ozark memory..."
Combine cabbage, tomatoes with juice, onion, Italian seasoning, salt, and black pepper in a large pot over low heat. Bring cabbage mixture to a simmer and crumble ground beef into the pot. 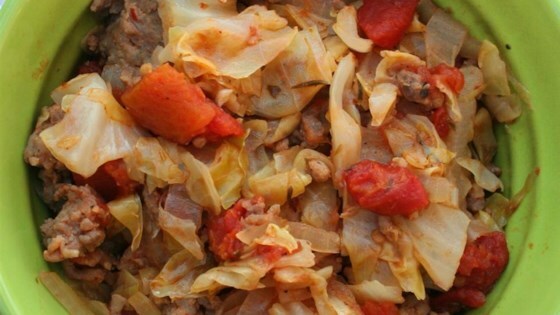 Cover and cook until cabbage is tender and ground beef is cooked through, about 45 minutes. Stir occasionally. See how to make the official meal of St. Patrick’s Day. Do not cook and then drain your meat; most of the taste will leave. I use 90/10 ground beef for this recipe. Perfect! Can't say anything bad about this one. It was perfect. I did add two cans of diced tomatoes. Absolutely going to be using this one again.